Miss Counterculture didn’t find this as amusing as I did. Not hilarious but no biggie, right? Twenty-three state Attorneys General with far too much time on their hands were shocked – shocked – at this novelty coffee mug. Something must be done! they cried and leapt into action with a Strongly Worded Letter (pdf). On behalf of the undersigned Attorneys General, we request that Urban Outfitters immediately cease sales of your “Prescription Line” of glasses, coasters, mugs, drink holders and related products that mimic prescription pill bottles and prescription pads. As you may be aware, there is a national health crisis related to the abuse and diversion of prescription drugs. As Attorneys General, we have prosecuted and engaged in outreach to stop this epidemic. We are actively engaged in a campaign of environmental change to educate the public that abuse of prescription drugs is not safe simply because the medication originated from a doctor. By putting these highly recognizable labels on your products you are undermining our efforts. These products demean the thousands of deaths that occur each month in the United States from accidental overdoses. You guys, this jokey mug mocks the deaths of thousands! Because there’s a design on the mug that talks about coffee and it… well, it looks kind of like a doctor wrote on the side of the cup and… the… it has coffee. Look, we don’t have time to go into all the reasons but this mug is basically a MURDERER. These products are not in any way fun or humorous but make light of this rampant problem. We invite you to pull these products from your shelves and join with us to fight prescription drug abuse. Are you people serious? IT’S A GAG COFFEE MUG. It’s not even a funny gag coffee mug, but that’s all it is. 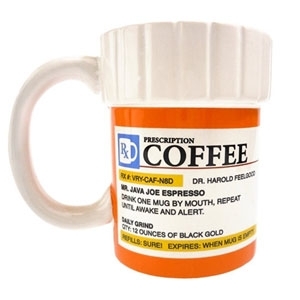 No sentient human on the face of the earth will mistake said mug for an actual prescription. Even if they were dim enough to make that error, the “prescription bottle” only contains lukewarm coffee from State U.’s cafeteria. The mug doesn’t mention illicit drugs or drug abuse, let alone deaths of drug abusers. Even if there were a person this unhinged, why on earth would they think they have a right to stop the sale of not-terribly-funny coffee mugs? Whenever your state government says they don’t have enough money for courts, schools or health care, remember that 23 of the highest-ranking officials had enough resources to waste on novelty drinkware. Urban Outfitters has a right to sell these cups without bullying from nanny-state enforcers. Now excuse me while I top off my far more impressive coffee mug. We thought they were cute. Bought a set for our doctor and his wife!!! !